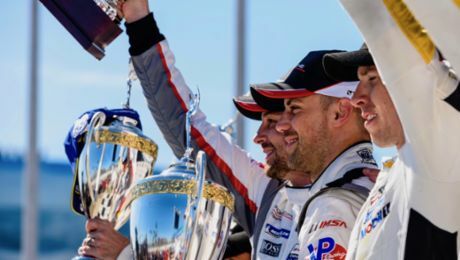 On 23 July, round seven of the most important and popular sports car race series on the North American continent, the IMSA WeatherTech SportsCar Championship, takes off on the Lime Rock Park racetrack. At just 2.414 kilometres, the Lime Rock Park racetrack located in the picturesque rural region in the US state of Connecticut is the shortest on the championship calendar. This marks the first outing for the Porsche North America factory team at Lime Rock Park, with the squad fielding two Porsche 911 RSR in the GTLM class. The racer from Weissach is based on the seventh generation of the iconic 911 sports car and so far this season has won the race at Long Beach. In the GTD class, Porsche customer teams campaign the new 911 GT3 R, the winning car at Laguna Seca. Fans are more than happy to drive two-and-a-half-hours from New York City to Lime Rock Park to experience the captivating sports cars in the GTLM class for the first time. Awaiting them is a very special motorsport experience: Because there are no grandstands, spectators follow the action from the grassy hills surrounding the racetrack and are well equipped with camping chairs and giant cool boxes. There is a special reason that races at Lime Rock Park are always contested on Saturday: On Sundays a service is held in a church on one of the hills next to the track. At Lime Rock Park, the reigning IMSA GT Champion Patrick Pilet (France) and Nick Tandy (Great Britain) again share the cockpit of the #911 Porsche 911 RSR, the winning vehicle at Long Beach. Piloting the number 912 vehicle are Earl Bamber (New Zealand) and Frédéric Makowiecki (France). Patrick Pilet competed at Lime Rock years ago, but for his Porsche North America teammates the circuit is totally unfamiliar. However, Jörg Bergmeister (Germany), who contests the GTD class for the Porsche customer team Park Place Motorsports as the fifth works driver, is a seasoned Lime Rock expert. He has won on this racetrack six times, most recently in 2012 with the 911 GT3 RSR. 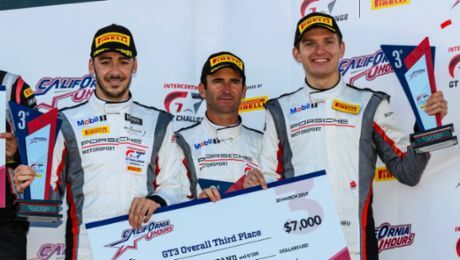 Driving for Seattle/Alex Job Racing is the former Porsche junior Alex Riberas (Spain) and Mario Farnbacher (Germany), the Laguna Seca winners. The 911 RSR is the most successful GT racing car of recent years. 2016 marks its last season as a works-run racer. Its successor is expected to make its racetrack debut in January 2017 at the Daytona 24-hour race. Porsche built the 911 GT3 R for GT3 series worldwide based on the 911 GT3 RS production sports car. The new customer racer scored its first victory in the IMSA SportsCar Championship at Laguna Seca in May. The race at Lime Rock Park takes off on Saturday, 23 July, at 15:05 hrs local time (21:05 hrs CEST) and runs over 2:40 hours. The race can be viewed live outside the USA on www.imsa.com. The IMSA SportsCar Championship is a sports car race series contested in the USA and Canada, which was run in 2014 for the first time. The series was formed from the merger of the American Le Mans Series and the Grand-Am Series. Sports prototypes and sports cars start in four different classes: GTLM (GT Le Mans), GTD (GT Daytona), P (Prototype) and PC (Prototype Challenge). The Porsche 911 RSR runs in the GTLM class, with the new Porsche 911 GT3 R contesting the GTD class.